It appears as if consumers from across the globe are not only spending breakfast, but lunch and even dinner, at Tiffany’s. Tiffany and Co. did well across all markets. Sales overall were higher by 15% buoyed by the strong spending across Japan and China. Sales in Europe were up sharply as well. Tiffany announced that sales in the U.S. were benefitted by more tourists making shopping trips in the U.S. Jaded New Yorkers started to buy more jade as well as other bling. The company announced that locals spent more during the quarter. Profits were boosted by the tax reform in the U.S. Overall earnings were up 53% from 2017. Tiffany said the effective tax rate it used was 25.3% for the quarter compared to 31.7% one year ago. Tiffany has had a strong run since the CEO position was handed to Alessandro Bogliolo in October of last year, who succeeded Frederic Cumenal, who during the earlier part of 2017 stepped down following a run of lackluster results. The new CEO at Tiffany formerly was in charge of Diesel SpA the Italian apparel business, and he was also an executive with Bulgari and Sephora. 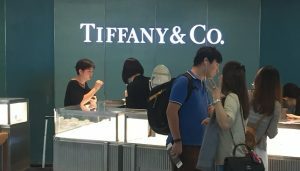 He added that in the release of earnings, Tiffany was encouraged in particular by the breadth of its sales growth in most regions and in all product categories. The company has also amped up its marketing with Bogliolo. He mentioned a new campaign for advertising that features Elle Fanning a Hollywood actress in both digital and print ads. Tiffany is also planning to spend more on its ads for the rest of the year, a move that the CEO said the company had decided to take because it was committed to reaching full, sustainable and long-term growth potential for the brand. The Trump Tower problems that Tiffany has are apparently in the past. The company placed blame on its sluggish sales during the holiday shopping season of 2016 and early in 2017 due to traffic disruptions post-election, close to its 5th Avenue flagship store. Stock as Tiffany hit a new high of 52 weeks on Wednesday and it up over 30% during the last 12 months.